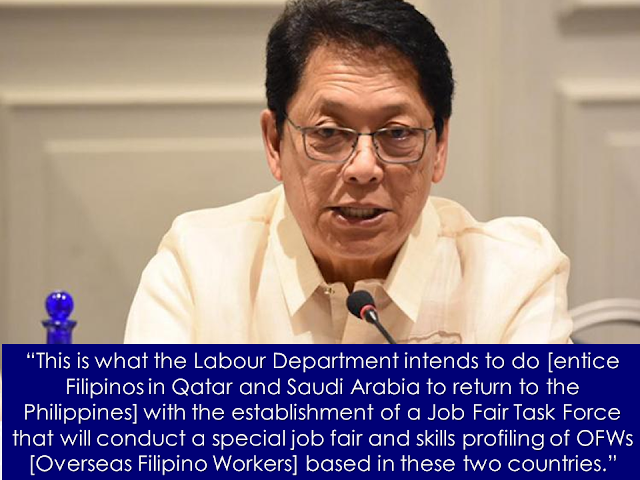 DOLE Secretary Silvestre Bello III directed the Philippine Overseas Employment Administration (POEA) and Bureau of Local Employment (BLE) through an administrative order, to undertake a supply-demand profiling and skills-job matching of Filipino workers in Saudi Arabia and Qatar. “We will review the conditions of our overseas workers in other countries, like Saudi Arabia, Qatar, Bahrain, Jeddah, and other parts of the Middle East. Kailangan i-review naming ‘yan. In fact, we will be seeking a revisiting of the existing bilateral agreements with these countries. We want these agreements to provide maximum and optimum protection to our OFWs,” he said. The Philippine government is encouraging thousands of overseas foreign workers (OFWs), who lost their jobs or were displaced by events unfolding in Saudi Arabia and Qatar, not to go back to the Middle East but instead,seek opportunities in other countries. According to Bello, if abuses against the OFWs goes on, the Philippines may be forced to restrict Filipinos from getting jobs, particularly employment as household service workers, in certain Middle East countries. 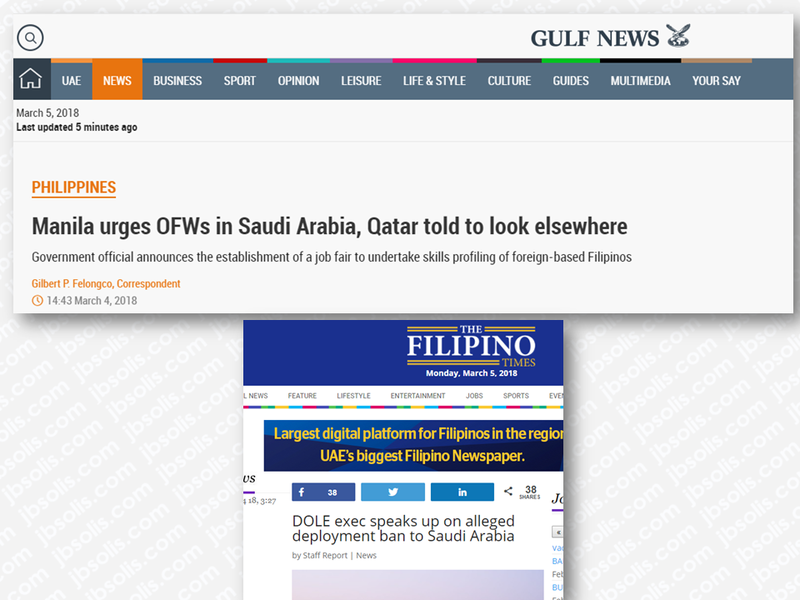 Meanwhile Filipino workers in Qatar are also under pressure due to the diplomatic row between Doha and Gulf Cooperation Council (GCC) member countries. According to Bello, OFWs that require further upgrading of skills as the participating employers require will be referred to the Technical Education and Skills Development Authority (TESDA) to undergo training prior to their deployment in the Philippines or abroad. The Philippines has imposed a ban for OFWs specifically those on “new contract”to be deployed in Kuwait following reports over the death of Joanna Demafelis, a Filipino housemaid who was murdered by her Lebanese and Syrian former employers and placed her remains a freezer in a n abandoned flat in Kuwait.